WASHINGTON (CNN) -- The United States is launching a diplomatic effort to get North Korean nuclear talks back on the rails. State Department representative Stephen Bosworth is traveling to Asia to discuss North Korea policy. Stephen Bosworth, tapped by Secretary of State Hillary Clinton to take the lead on North Korea policy, leaves Washington Wednesday on a weeklong swing through Asia. He'll visit China, South Korea, Japan and Russia -- the other members of the so-called six-party talks. 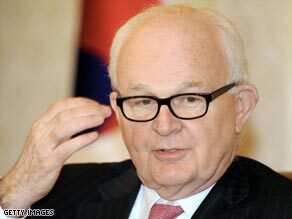 Bosworth is not scheduled to visit North Korea. "There are no plans for that delegation to travel to North Korea," State Department spokesman Robert Wood said Tuesday. "We are looking first and foremost to try to convince the North to come back to the negotiating table," Wood said. "The purpose of the trip is to work with our allies to find a way forward and convince the North to come back to the negotiating table." The United States hopes to persuade China particularly to pressure North Korea to resume the talks on how to dismantle North Korea's nuclear program. If that fails, this latest diplomatic effort may clear the way for the United States and the other members of the six-party talks, minus North Korea, to impose new punitive measures against a country desperate for food and energy assistance. Bosworth was widely criticized in April when he said he hoped the talks could resume once the North Koreans had fired their ballistic missile, in defiance of the United States and others. "We will be, as I said earlier, working very closely with our partners to ensure that after the dust of the missiles settles a bit, we get back to the longer-term priority -- of the six-party talks," Bosworth said April 3. The North Koreans launched the rocket April 5. Since then relations have become more strained. After the United States guided a mild rebuke of North Korea through the United Nations, North Korea expelled international inspectors from its nuclear sites and announced plans to restart the reactor that produces plutonium for its nuclear weapons. It also has threatened to launch more rockets and test another nuclear device and North Korea has detained two U.S. journalists. Wood said Tuesday he had no update on their case. "We remain very concerned about ... their well-being," Wood said. "And we're working diplomatically to try to get them released."